The new Swarovski Star for the Rockefeller Center® Christmas Tree, designed by renowned architect Daniel Libeskind, has been revealed in New York City. The Star was presented during a morning ceremony in Rockefeller Plaza, hosted by Nadja Swarovski, Member of the Swarovski Executive Board, and Daniel Libeskind. During the event, the Star was raised to the top of the Rockefeller Center Christmas Tree, where it will first be lit during the official tree lighting ceremony on Nov. 28. The new Swarovski Star is the first redesign of the famed crystal tree-topper since the inaugural Swarovski Star was unveiled in 2004, when the company first partnered with Rockefeller Center co-owner Tishman Speyer to present the Star. Libeskind's Star is a brilliant showcase of Swarovski's 120-year heritage of turning light into delight. The 900-pound star is 9-foot 4-inches in diameter and features 70 spikes covered in 3 million Swarovski crystals, harnessing the company's innovative crystal technology and mastery of the refraction of light in a dazzling, three-dimensional structure. The dramatic architectural lines push through space, bursting with dynamism in a radiant reflection of Libeskind's design vision. Later this month, Swarovski will debut the Star Boutique on Rockefeller Plaza, also designed by Daniel Libeskind. The 200-square foot shop is crystalline and star-like in form, with a faceted construction created from glass panels and video screens. Visitors can purchase jewelry, ornaments and gifts from Swarovski and Atelier Swarovski, including a new range designed by Daniel Libeskind for Atelier Swarovski Home. An exact replica of the Swarovski Star, also created with 3 million Swarovski crystals, will be on display at ground level next to the Star Boutique, enabling visitors to explore its design close-up. 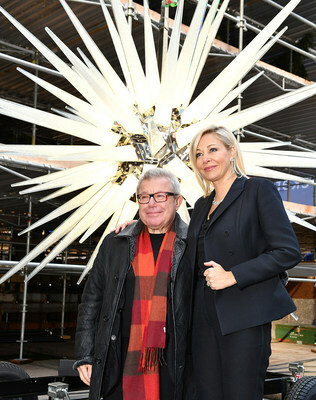 Nadja Swarovski, Member of the Swarovski Executive Board, commented: "We are honored to work with one of the world's greatest creative talents, Daniel Libeskind, on his thrilling new design for the Swarovski Star atop the Rockefeller Center Christmas Tree. Each holiday season the Star brings joy to New Yorkers and visitors from around the world, and will shine as a beacon of hope for many years to come." Daniel Libeskind, Principal Design Architect of Studio Libeskind, commented: "The new Swarovski Star for the Rockefeller Center Christmas Tree is inspired by the beauty of starlight - something that radiates meaning and mystery into the world. The Star is a symbol that represents our greatest ambitions for hope, unity and peace. I am tremendously honored to collaborate with Swarovski on the Star, and with the entire design team, to bring cutting-edge innovation and design to crystal technology." A previous Swarovski collaborator, Libeskind is renowned for his design of cultural spaces and monuments, including the Jewish Museum in Berlin, the Denver Art Museum and the master plan for the reconstruction of New York's World Trade Center site. In 2016, Libeskind created a crystal and marble chess set for Atelier Swarovski, with pieces inspired by his cutting-edge architectural designs. Projects such as the Swarovski Star honor Swarovski's heritage of collaboration and innovation, partnering with visionary design talent to push the boundaries of crystal creativity and craftsmanship, with the aim to create a more sparkling world. Recognized globally as a symbol of hope, community and holiday cheer, the Rockefeller Center Christmas tree brings together New Yorkers and visitors in a celebration of the holidays. The tradition of the Rockefeller Center Christmas Tree dates back to 1931. Swarovski delivers a diverse portfolio of unmatched quality, craftsmanship, and creativity. Founded in 1895 in Austria, the company designs, manufactures and markets high-quality crystals, genuine gemstones and created stones as well as finished products such as jewelry, accessories and lighting. The Swarovski Crystal Business is run by the fifth generation of family members and has a global reach with approximately 3,000 stores in around 170 countries, more than 27,000 employees, and revenue of about 2.7 billion euros in 2017. Together with its sister companies Swarovski Optik (optical devices) and Tyrolit (abrasives), Swarovski Crystal Business forms the Swarovski Group. In 2017, the Group generated revenue of about 3.5 billion euros and employed more than 32,000 people. Studio Libeskind is involved in designing and realizing a diverse array of urban, cultural and commercial projects around the globe. Our Studio is a collaboration of architects and designers that believe architecture is a practice of optimism. We approach our projects with the attitude that to make great places, you must believe in the future, but also remember the past. Studio Libeskind's architecture emerges from the idea that a building should be expressive and reflect contemporary life. Innovation is at the core of our design process. We believe that bold design must be realized with sustainable technology and we strongly believe that the art of architecture lies in creating a maximum impact within the constraints of budgets and functionality. We know from experience that great architecture comes from working with great clients; however, architecture is a public art and we hold ourselves accountable not only to the client, but to the communities, and cities in which we build.